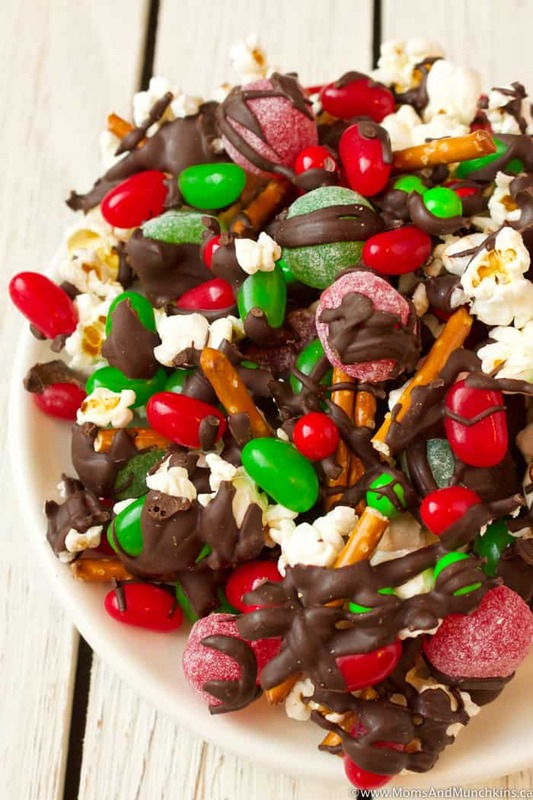 This Christmas Crunch Snack Mix is a delicious combination of sweet & salty – popcorn, pretzels, jelly beans, gum drops, candy coated chocolates and melted chocolate. Have you ever had jelly beans or gum drops with chocolate? Get ready to be hooked – so yummy! 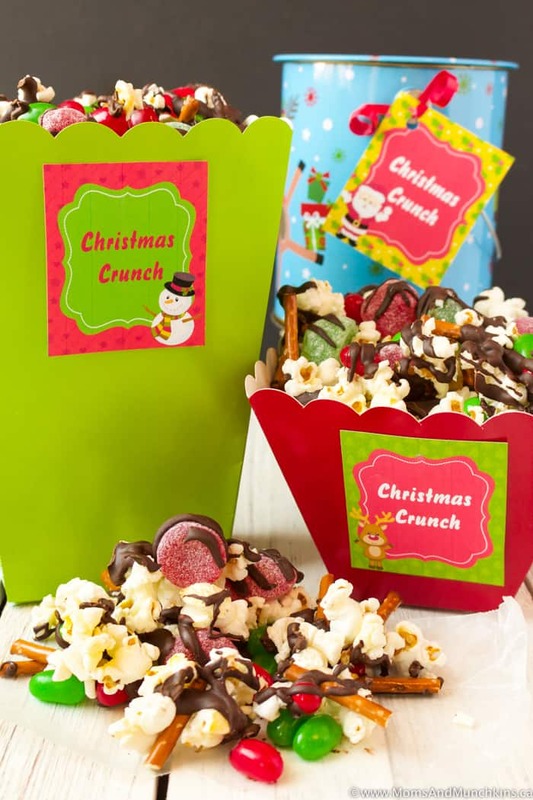 This is a fun snack idea for a Christmas movie night with your family or it makes a great DIY gift idea for friends and family. And yes, we have free printable tags for this too! I’d recommend storing this Christmas Crunch Snack Mix in the fridge so the chocolate doesn’t melt and create a delicious but chocolatey mess. Click here to download the free Christmas Crunch printables. I don't include quantities in this as you can load it up with as many sweets and as much melted chocolate as you'd like. For a 125g large bag of popcorn, I used 8 ounces of melted Bakers semi-sweet chocolate. Line a cookie sheet (or two, depending how large of a batch you are making) with wax paper. Spread popcorn out on wax paper. You'll want a single layer of popcorn only so that you can evenly cover it all with chocolate later. 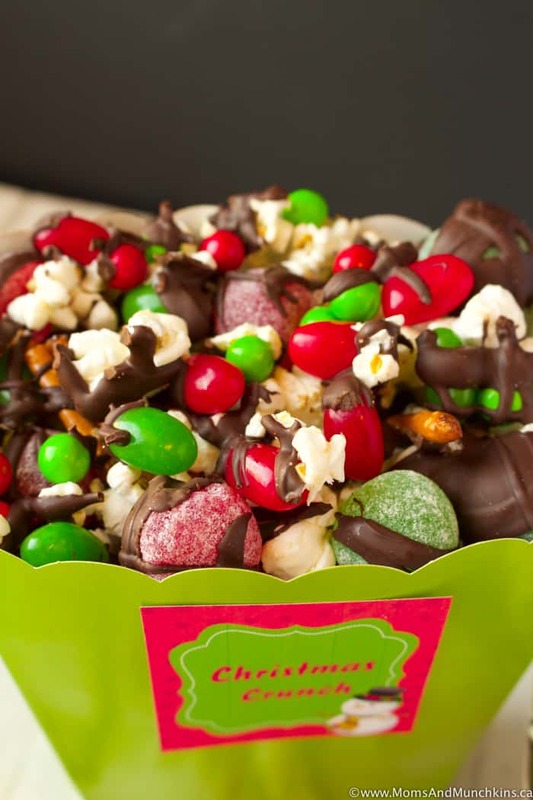 Scatter jelly beans, gum drops, pretzels and candy coated chocolates over popcorn. Drizzle melted chocolate over the mixture. Place cookie sheet(s) in fridge for about 30 minutes until chocolate has completely hardened. Break into pieces and store in a resealable food storage bag. Keep this stored in the fridge so the chocolate doesn't melt. 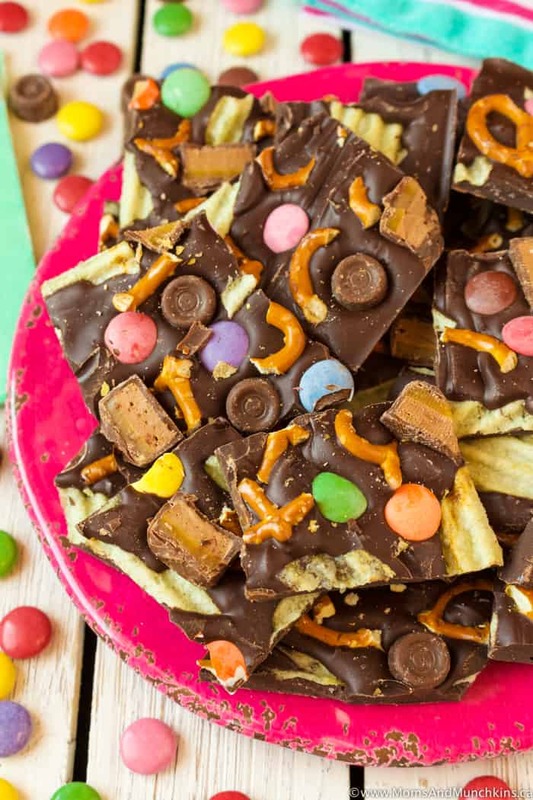 Sweet & Salty Bark – chocolate on potato chips? Yes! Trust me on this one. 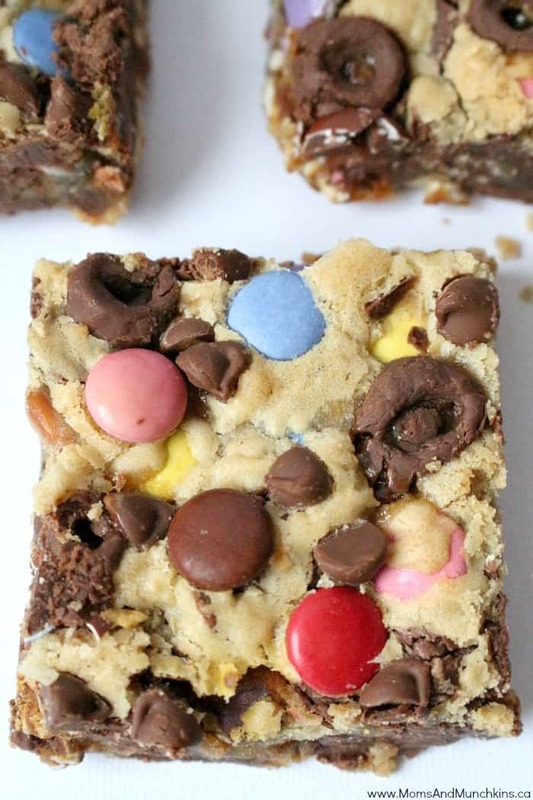 Sweet & Salty Cookie Bars – a unique treat for your next cookie exchange. Find more fun ideas for the holidays on our Christmas page. Stay updated on the latest by following us on Facebook, Twitter, Instagram and Pinterest.